This Metallic Champagne Indian Embossed Pebbles Paper makes a bold addition to any paper project with both a metallic finish and a textued surface that looks like little pebbles! Reflect the light in all directions with this intriguing hand-made paper. 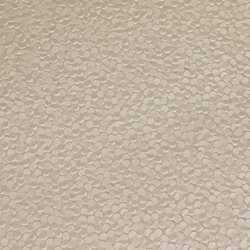 This Indian paper is made by hand then machine embossed to provide a unique pebble pattern. The embossing allows the light to shine off all the different angles of the embossed pattern, almost like mica. With a metallic finish, this embossed paper provides depth and texture not possible with smooth sheets of paper. Made from long cotton fibers, Indian Embossed Paper maintains substantial weight (150 gsm) and strength for all types of artistic creations. Available in 8.5" x 11" and 22" x 30".